Although TV is still our most used type of media, the highest growth in media consumption has been registered for internet usage. Many still adopt a traditional approach in their media consumption, yet our experiences are now supplemented by additional devices/types of media and this has driven the number of cross channel media experiences that we see around us each day. 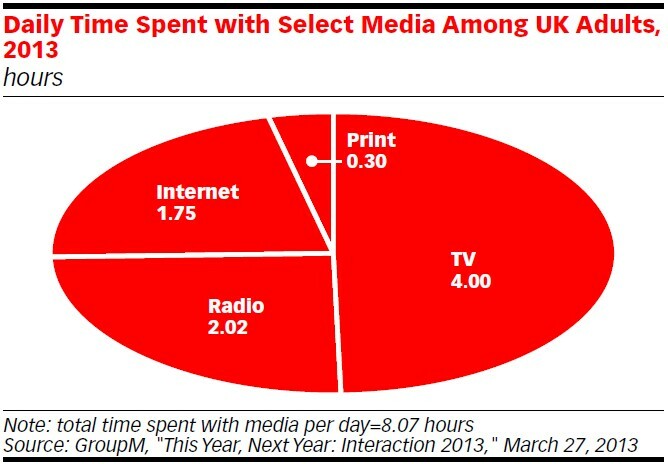 In their recent report, titled “UK Time Spent with Media”, E-Marketer described digital media as having a “disruptive nature” in the traditional media universe and this is an accurate summary of the digital infiltration into TV, radio and print. For example, we now see print ads littered with references to online and social media campaigns. TV is also now vastly supplemented with content from and supported by the Internet, with live streaming of shows online and the ability to access greater content by connecting your digital television box to the Internet. Online catch up services in particular are extremely popular, with BBC iPlayer the most frequently used offering. Despite the rapid growth of online TV services, social media remains our top reason for using the Internet. Using our Facebook, Twitter and other social profiles accounts for 1.18 hours of the time we spend online each day. But there has also been a change in the way that we consume the internet and comScore recently revealed that 31.9% of internet traffic comes from non-computer devices. This poses a number of questions regarding future marketing initiatives. Firstly we must consider the influence of mobile and tablet devices in our marketing strategies? Secondly many marketers will now be asking themselves how they can harness the power of cross platform campaigns? and lastly how they will manage the measurement of such campaigns?